A core objective for Economic Development Integration at EDA, is to increase your access to the most relevant federal resources that support job creation, drive innovation and entrepreneurship, and build resilient regional economies. This page offers resources to help communities across the US to more readily identify and apply for the federal economic development resources that best support their local priorities and objectives. EDA funding opportunities are just the tip of the iceberg regarding federal resources that can support a comprehensive regional strategy. A full range of funding opportunities can be found at the following sites, which are arranged from the most comprehensive online resources (i.e. 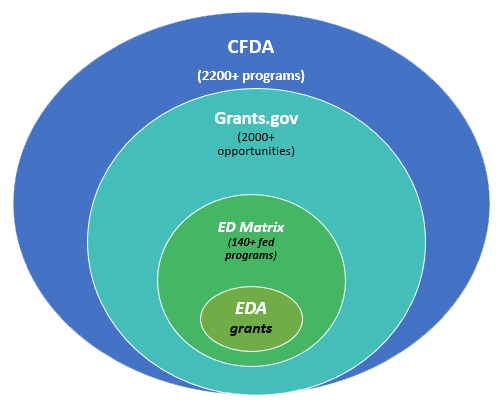 Grants.gov and the CFDA) to more targeted resources including EDA’s own set of funding opportunities, many of which are open now. Again this is just the tip of the iceberg regarding federal resources that can support a comprehensive regional strategy. We can help you find the rest of that iceburg.